The Blacktron vessel Angel of Chaos is a space warship of the Blacktron Alliance. Featuring a main armament of three massive gamma-ray lasers, it is one of the most powerful ships in Alliance service. The power system is a second-generation version of the experimental system pioneered by the Blacktron Invader, and is also featured on the second-generation Intruder (see previous post). The improved power management system allows for considerably higher power usage, but at the cost of crew radiation exposure levels that the Galactic Federation deem unsafe. The power levels on Angel of Chaos are high even by these standards, and the gamma-ray lasers are of a type more typically found on the largest hypercruisers and dreadnoughts. Radiation exposure levels are also correspondingly high, and the crew of the “Angel” consider themselves a breed apart. A quartet of powerful engines drive this ship at high velocities through both normal space and hyperspace. The Angel of Chaos is partly an experiment with radial construction, and partly a homage to the Liberator, the spaceship from a largely forgotten British sci-fi TV show from the ’70s called “Blake’s 7”. Some day I’ll attempt the spherical drive unit from that original ship, but I’m not that good yet. I think the radial technique would actually work better on a larger model, but not knowing that I could successfully pull it off, I was reluctant to invest the time involved in building a massive model. The most satisfying part of this model for me is the way I managed the transition from 12-fold radial to 8-fold radial to more regular unidirectional SNOT construction. The three turrets around the main hull rotate as well as elevating, though this is not true of the cockpit guns, which only elevate. 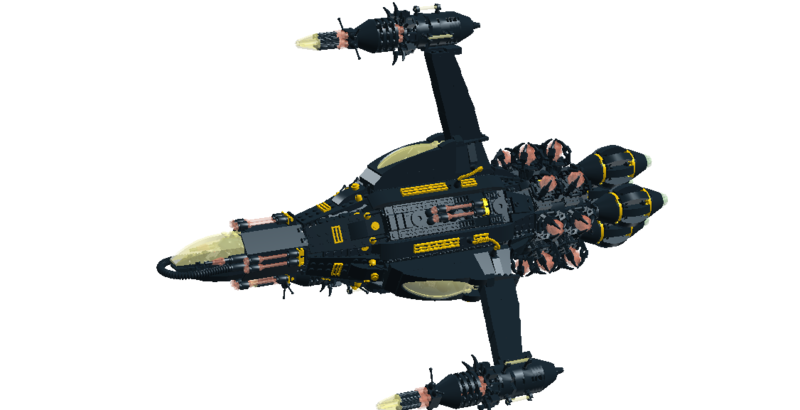 This entry was posted in Blacktron, Lego Classic Space and tagged Blacktron, Blacktron Alliance, Blakes 7, LDD, Lego, Lego building, Lego spaceship, Spaceship on June 17, 2015 by geoffhorswood.